Haiti is both one of the poorest and one of the most disaster-prone countries in the world. In addition to the devastating 2010 earthquake and the subsequent cholera outbreak, the country is regularly hit by hurricanes which frequently trigger landslides and floods that wash away whole neighbourhoods. The International Organization for Migration (IOM) is one of the organisations that has been supporting people in Haiti for many years, particularly those who have been displaced from their homes and now live in one the many camps in the capital Port-au-Prince. To improve their programs IOM has invested early in drones. The organisation bought a Sensefly Swinglet Fixed Wing drone that is kept in Haiti and has trained staff in how to use the drone. This enables IOM to respond much faster than other organisations that first need to bring UAVs and trained personnel to a disaster area. 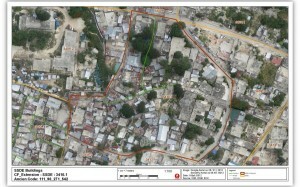 Orthomosaics like these helped IOM conduct a census in Haiti. The International Organization for Migration (IOM) first used unmanned aerial vehicles (UAVs) in Haiti in early 2012 to help establish how many people lived in seven camps that IOM was managing. IOM had originally considered this to a one-off initiative, but eventually decided to monitor the camps continuously. In the years that followed, the UAV became a well-established tool to monitor the more than 40 rapidly evolving camps around the country. As many of these camps were growing or shrinking in size over time, being able to get a bird’s eye view meant that decision makers were better able to respond to the needs of the camp inhabitants. IOM was also quick to use drones when Hurricane Sandy struck Haiti in 2012. After three days of continuous rain, the Grey river in Port-au-Prince burst its banks and destroyed many homes. At least 54 people died during the storm. As drones are not limited by cloud cover, the UAVs could be deployed quickly once the storm had passed and were able to complete mapping seven days before the first satellite images became available. 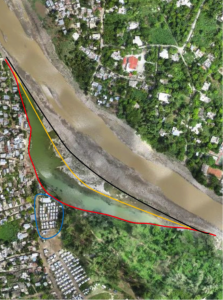 IOM and the OpenStreetMap Community of Haiti (COSMHA) then used the drone imagery to assess the extent of the damage by comparing before and after images of the flooded areas. This allowed analysis to determine where assistance was most urgently needed. As a final step, IOM used the data, together with historic satellite imagery, to calculate which areas were at high risk of future flooding. This was then used to plan a protection wall to protect at-risk communities in the future. You can download all case studies on drones.fsd.ch. 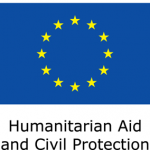 Drones in Humanitarian Action is partially funded by DG ECHO. 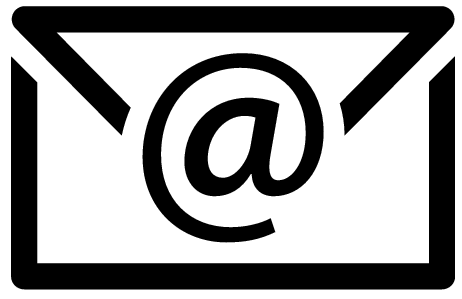 The views expressed in this blog post should not be taken, in any way, to reflect the official opinion of the European Union, and the European Commission is not responsible for any use that may be made of the information it contains. Timo is a humanitarian communications professional who occasionally supports CartONG. He specialises on the impact of digital technologies on disaster response operations.